Graduated in Accounting from Instituto Comercial do Porto. 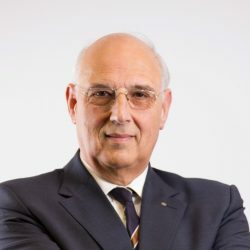 He has been a manager since 1980 in several companies in the Agro-Food and Metalo-mechanical sector and Councilor of the City Council of Anadia and President of the Municipal Assembly of Anadia. He is currently Vice-President of C.A. de Alianza – Vinhos de Portugal S.A., President of the General Council of the Viticulture Commission of Bairrada, Chairman of the Audit Committee of the Professional School of Viticulture and Enology of Bairrada, President of the Bairrada Confraternity of Enófilos. He is also Vice-President of the Board of Directors of the Portugal-China Chamber of Cooperation and Development, Member of the Board of Directors of the PCI and the Port Community of Aveiro, Member of the Board of Directors of the CEC, General Council of the CIP, President of the General Assembly of CESAE, Chairman of the General Meeting of Mais Vagos, SA and Member of the Board of Directors of Aveiro-Expo, EM.